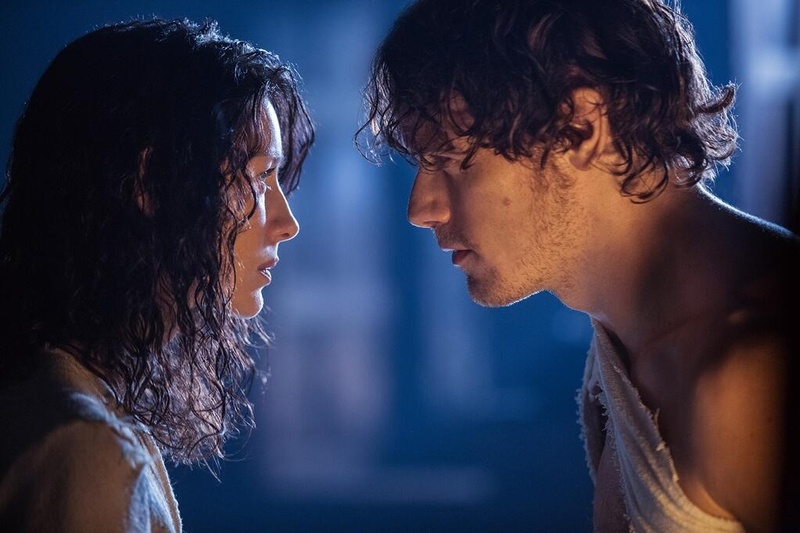 Aug. 9th will change everything…..what I’ll miss…Outlander! – My Outlander Blog! So, yesterday was interesting. I didn’t get much writing done because we fans experienced a virtual onslaught of Outlander news and images. I’m pretty sure my heart and breathing rates were scary! But, I’ve had a good night’s sleep and I’m sitting here processing the whole PR event. I’ve come to the conclusion that August 9th is going to change everything and there are going to be some things I really miss. Was lesson 12 really the last one? What will I do without Adhamh urging us to “say it with” him? I’m sure I’ll still see his tweets and photos around Twitterworld because the man is verra popular. He meets with fans when they visit Scotland and solves any and all Gaelic issues, but I’ll miss those videos! I hope marketing people are gonna take a look at the social media interaction between the fan base and the Outlander Starz cast and staff because it’s been a singular experience. From the very beginning, they have made us fans feel apart of the process. As a result, they have generated a lot of good will and loyalty. I think some genuine friendships have been made! They have been so open to questions and chatting with us. Heck, even the stars’ drivers get in on the act! Those boys can eat! At this point, a fan can tweet a cast member and have a reasonable expectation of getting a response. Send them some bake goods or a care package and they know who sent it to them. I think there truly is a feeling of “family” with this bunch. We know stuff about them personally and care about them. But….I’ve been worried since the beginning that these actors have no idea what’s about to hit them. And after the premier? I think the current fan base will experience an influx of newbies and that will change things. I welcome the numbers (hey, I want season two), but I’ll miss the closeness. Love these two! I’ll miss Matt’s beautiful POTD of scenery of Scotland. Wow! Really Matt they were breathtaking and kept us excited to see our characters in these settings. Maril, a fellow fan and the queen of squeee, gave us words heard on set that helped us speculate about what scenes were being filmed. So much fun! I learned so much about the effort it takes to create an epic period film. She was so generous of her time and shared information about historical clothing. I hope I still will get to see pictures of her puppy in puppy prison or muddy and wet from a romp across a Scottish field. This is new for Herself too! I’ve been so excited for her. Who gets to experience something like this!? She shared her thoughts and journaled her experiences for us. We got to feel like we were on this journey with her. I loved seeing her on set and her interaction with the cast and crew, right Sheugs? Her books are wonderful and she deserves the attention she’s receiving. I guess this is what I’ll miss the most. The novelty of sharing the dream of our beloved books and characters coming to life. I’ll miss these things, but I remind myself that we are days away from SEEING Outlander. This was the goal after all! So, I’ll say goodbye to the old good things and hello to the new good things! Thanks everyone! Squeeeeeee! Hopefully we will still get Speak Outlander videos and POTD from Matt. Some thighs will change and yes, the fanbase will be different…but the show will definitely need the numbers to stay afloat. It’s been a wonderful road…and sometimes the anticipation is the sweetest part! But I hope we have a very long road to travel together. Thanks April! I’m hopeful too! Gotta admit I’ve seen some fan postings on FB that scare me a bit! I agree that we’ll lose a bit of the closeness perhaps, but we’ll also expand our fan base with new friends who will be so jealous of the times that we’ve spent with the cast and crew prior to the premiere. We just have to go with the flow, re-reading and re-watching with eagerness for the future while we impatiently await Book 9 (and hopefully Book 10) along with Seasons 2, 3, 4, etc. Thank you! I’m feeling hopeful! This will be great! Wouldn’t that be great! Ten years! Think Sam and Cait will get sick of each other? LOL! Thank you for this post. I was thinking about this the other day. That some things will change and we will lose the intimacy we have in our community forums and Facebook groups as well as with the cast and crew. We are going to have to share this precious and beautiful creation with people who will not keep it sacred because they will know nothing about it as they watch. At first this had me really sad (and a bit scared) but then I got to thinking some more. I have been fortunate. I am a travelling salesperson and I made efforts to meet up with other Outlander “fan”atics in each town I visited and made some amazing friendships. I got to meet DG and a ton of other people who felt the same way I did at the Philly signing. I have been to two gatherings and now I am comfortably cushioned with loyal devoted people who share my obsession. That fact alone should help buffer me from the random weirdos who try and tear things down just because they can. I feel like I am sending my children off to college and exposing them to the harsh realities of the world. (Silly right?) I want to keep them safe and nestled but they can’t reach their true potential if I don’t let them go. I am also so excited that I am vibrating with energy to see this come to fruition. But while we are giving up the Speak Outlander videos and such (for a while as I suspect we will get more interaction if [WHEN!] season 2 begins filming) but we will gain even more. The stars will do the talk show circuits and Comic Con and all the public relations and promotional work that is a necessary part of the TV process. We will get to watch this aspect grow and evolve and while the loss of intimacy is sad I want to see Sam and Cat become super stars and have success beyond their wildest dreams. Thank you! Loved reading this! It reflects so many of the responding I’ve been getting. We all feel so close to this project! Great blog, Beth. I’m one of the probably huge group of Outlander fans who seldom post or comment on what I’m reading on Twitter, Facebook, etc. – hard to keep up with everything! But, I do feel connected to the fantastic Outlander clan of readers. I hadn’t thought much about just how things will change once the tv series comes out, until I watched the video of Diana’s Sacramento library talk. She talked about helping Sam, in particular, understand social media/fame interaction with fans, but warned that the series will change everything. I forget her exact words, but it was generally that just the size of her books makes them only appeal to reasonable, thinking folks. An hour long tv show will reach a totally different group, who have other expectations altogether and some of them could be scary! Your post reminded me of that, as well as the other changes coming for us long-term Outlanders. We’ll have to stick together! First, thank you for reading! And I haven’t seen the youtube talk. I’ll have to look it up. It is so strange, but I do feel worried for those two, Sam and Kait. I’ve felt all along that they truly have no idea what’s coming for them. Fans now? For the most part, great! After the show….worried. Beth, I have just read all of your blogs and want to thank you. You have expressed so many of my thoughts and feelings about all things Outlander beautifully. Thank you! I guess you could say that this is just one more thing that happened because Diana wrote a book! I was inspired to start writing! Oh! And I looked! Much more to read! I think you would enjoy some of my earlier pieces. Try… maybe it’s all in the details Or he’s a man and that’s no small thing!